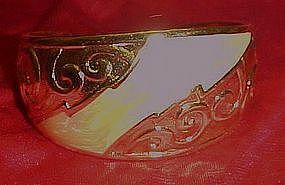 Brand new gold tone cuff bracelet with ornate scrolls and a marbled cream enamel contrast. Measures 1 1/2" wide in the center. Never worn.